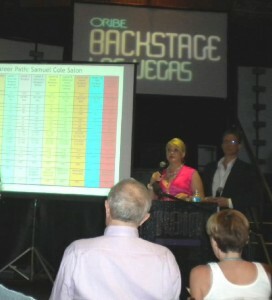 April 26, 2010 (Las Vegas, NV) – Raleigh salon owners, Jack and Joelle Ray, were the featured keynote speakers at Oribe Canales’ Backstage 2010 event in Las Vegas. Backstage 2010 was a two-day educational event designed to inspire stylists and salon owners through hands-on sessions with Oribe. The Owner’s Forum highlighted successful salon owners who shared their wisdom and insight. The Rays were asked to be the keynote speakers for the forum. Umbrella Salon located in San Jose, CA won a comprehensive salon business review offered by the Ray’s new venture – Samuel Cole Consulting Group. Umbrella Salon will receive a complete business review and strategic plan of all of their salon business systems, such as education, compensation, benefits, leadership, and financials/budgeting. The Rays are veterans in the hair industry and have a proven track record for running successful salons. Their award-winning Samuel Cole Salon has been continually growing and prospering over the past thirteen years. Salon Moxie is their newest edition and is flourishing under their recipe for success in its third year. “It was an extraordinary honor to be asked by the president of Oribe to speak to such an illustrious group. The owners attending the forum represent the top 20% of salons in the country. To be singled out to share our business strategies with them was incredible,” said Joelle. 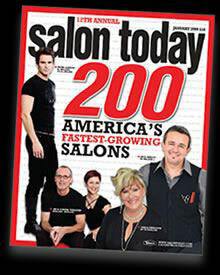 January 1, 2010 (RALEIGH, NC) – Samuel Cole Salon was named one of the top 200 salons in North America by Salon Today magazine in four categories – Growth, Retail Sales, Advanced Education, and Compensation/Benefits. 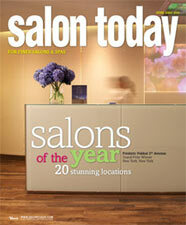 This exclusive list is published annually and selects salons based on their best business practices and salon growth. “Samuel Cole Salon is excited to be named to this “Who’s Who” list for our industry. We are thrilled to be recognized and are honored to be part of such an elite group of salons”, said Jack Ray, co-owner of Samuel Cole Salon and Salon Moxie with his wife, Joelle Ray. The award-winning Samuel Cole Salon located in North Raleigh is a Bumble & bumble network salon and features the ultra exclusive Oribe luxe haircare line. Oribe was created by the legendary celebrity and fashion stylist, Oribe Canales. The salon has been featured nationally in Salon Today, American Salon, Modern Salon and Metro Magazine, as well as internationally in Estetica (Italy) and StyleSpeak (India). May 14, 2007 (RALEIGH, NC) – According to Salon Today magazine’s panels of judges, Samuel Cole Salon in Raleigh has the second most beautiful and innovative interior of any hair styling salon in North America. Owners Jack and Joelle Ray recently learned that their remodeled and renovated salon in North Raleigh has been named First Runner Up in Salon Today’s annual “Salons of the Year” decor competition, placing it second only to the grand-prize winner, Frederic Fekkai’s new salon in New York City’s trendy meat-packing district. Located in North Raleigh, Samuel Cole Salon officially unveiled its new, modern, curvilinear interior in February of this year. It was designed by Clark Hipolito of The Art Company with Michael Perry of Porto in Raleigh, in direct collaboration with the Rays. The award-winning interior features sleek espresso-colored cabinetry, a polished Pakistani onyx reception counter, a glowing shampoo station with sculptural bowls, and both bamboo and cork flooring. Jack Ryan of Glasgow Metalworks in Raleigh created the handcrafted, stainless steel color bar. The remodeling enlarged the salon from 1400 square feet to 3000 square feet, which gave Hipolito and Perry ample room to use custom-designed cabinetry to create separate and distinctive areas for styling services, retail, and reception. The overall design concept also strikes a balance between “urban chic” and “warm and inviting” by juxtaposing the more sleek, modern aspects of the interior with such elements as a pale blue ceiling and the honey-hued flooring. The “Salons of the Year” competition focuses on new and newly remodeled salons. According to the magazine, judging takes place in three phases. First, the editors review each entry, which consists of photographs and essays. f8 Photo Studios of Raleigh provided Samuel Cole Salon’s photography. As first-runner up, Samuel Cole Salon will receive a full-page feature in the magazine’s June 2007 edition. The salon is also scheduled to be featured in American Salon magazine this summer. Based in Lincolnshire, Illinois, and published by Vance Publishing, Salon Today is a leading business magazine for fine salon and spa owners. Its sister publications include Modern Salon, Process, and Renew magazines.